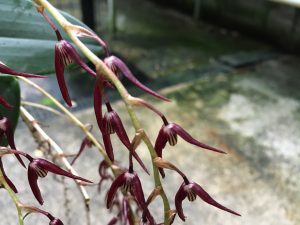 This is one of the most rewarding pleurothallis species we grow and one we think more people should have in their collections. It is a robust species that grows attractive glossy leaves before producing long dramatic spikes of deep red flowers in the autumn. 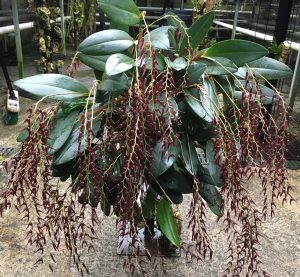 It will produce fantastic specimen plants as well as flowering from small plants. The plant shown on the left is mounted on bark but it grows happily in pots and baskets too. The natural habitat of the species is damp forests and cloud forests from Mexico to Panama between 700m and 2400m altitude. This broad natural range supports our observation that this is an adaptable and accommodating plant to grow. We have found that the plant does best in deep shade and heat/light stress can cause leaf drop.